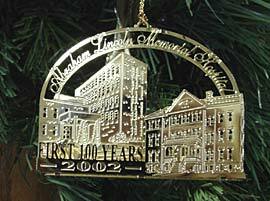 Main Street Lincoln's 2002 ornament celebrating Abraham Lincoln Memorial Hospital's 100 anniversary is now available. (217) 732-2929 for more information. Don't have a pear tree? Have no idea where to get a partridge? Five golden rings are beyond your budget? Can't find 11 pipers listed in the yellow pages? a gift that keeps on giving. Click here for details.